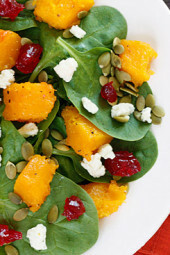 The sweet-salty combination of the roasted butternut squash, dried cherries and gorgonzola cheese along with the slight crunch of the pumpkin seeds topped with a honey dijon vinaigrette will have you savoring every bite of this spinach salad! Not having a plan for the butternut squash I purchased a few days ago, I really enjoyed this salad for lunch today. It far exceeded my expectations and was satisfying enough to enjoy as a main dish. In addition to the symphony of flavors and textures of this salad, the colors just scream Fall, perfect to add to your Thanksgiving menu! You can cook the butternut squash ahead of time and refrigerate it until you are ready to assemble. In a large bowl, toss the butternut squash with 1 tablespoon of olive oil, 1 tablespoon honey, salt and fresh ground pepper. Place on a baking sheet and roast in the center of the oven for 20 – 25 minutes, turning half way, or until tender. When done, remove from the oven and let it cool to room temperature. Meanwhile, combine the vinegar, shallots, remaining honey, mustard and whisk in oil, pinch of salt black pepper. 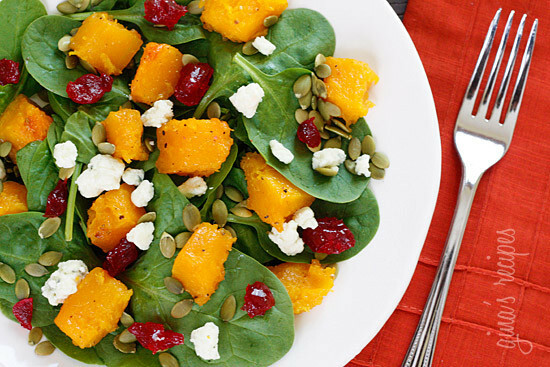 Divide the spinach on 4 plates and top each salad with the roasted butternut squash, pumpkin seeds, dried cherries, and the crumbled gorgonzola cheese. Drizzle the dressing over each salad and serve immediately. I’ve made this a few times before and it’s delicious. Do you think substituting roasted carrots for the squash would be good? Is it 7 points for the whole salad? Making again for Christmas Eve! Oh, and I used Craisins instead of dried cherries. This was just wonderful, and my company raved! I bought precut b-nut squash at Walmart. Used Good Seasons Italian Dressing (from mix) to save time. Next day had with leftover baked salmon. OMG! Heaven! BEST. SALAD. OF. ALL. TIME. This salad was awesome! 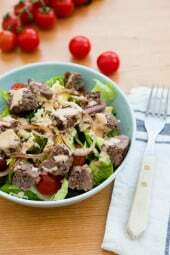 I split mine into 3 servings, to make it a bit heartier as a main dish salad. Really great, and the butternut squash cubes are almost like soft "croutons". Yum! Just served this at a dinner with a savory strudel and I have to tell you, even my husband who hates salads ate this up! Everyone loved it and I didn't change a thing. This is ABSOLUTELY DELICIOUS. Gina, my younger (grown) daughter and I fixed this, your pumpkin pie (using gluten-free crust),and your mashed garlic potatoes for Thanksgiving dinner. No one even missed the calories and it was all so delicious. Although we live 3 hours apart, she and I use your recipes all the time. Thank you so much for this site and for all the time you take perfecting them. Happy Thanksgiving! Had this again today, only this time I did it exactly as written. (Found white balsamic at TJ's.) It was delicious before but today it was AMAZING. Thanks again Gina! I am soo happy you all liked this salad!! I find dried cherries at Trader Joes, you can use cHerry craisins instread. Cider vinegar would work in place of the white balsamic. This is not only my new favorite salad, it's my new favorite thing to eat!! Amazing! Thanks for the recipe, Gina. SO GOOD. Can't wait for leftovers! Just finished having this for lunch, it was amazing! Thanks gina for another winner! I don't know if I'm doing anything wrong, tried to print this recipe using the "print friendly and PDF" button. Out came 10 pages and I only needed 1 page and the alignment is off as well, maybe you want to take a look at it? This was great! I had to make a few substitutions – goat cheese, craisins, and toasted pecans, and regular balsamic in the dressing. This was a nice side dish for dinner, and would make a very nice lunch on its own. Thanks so much for the idea. I made this salad last night and it was a huge hit (and I don't usually like butternut squash!). I have the leftovers for lunch and can't WAIT to eat them. I couldn't find pumpkin seeds so I threw in some walnuts, substituted goat cheese crumbles for gorgonzola, and because I can never seem to find dried cherries, I substituted cherry-flavored craisins (ocean spray brand). Oh and I used regular balsamic because my dumb supermarket would never carry anything "exotic" like white balsamic 🙂 Tonight I'm making your Asian Meatballs – my husband is super-excited about those, especially after having this salad! I tried this tonight, it was delicious! I substituted Bragg's apple cider vinegar for the balsamic since I forgot to buy some, and served it with Trader Joe's coconut shrimp on top for a main course salad. Do you have a good place to buy dried cherries? Looks good! Love roasted veggies on anything and sweet/sour combos! Brilliant salad. 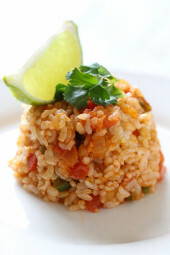 Perfect for a side salad or a light meal. This is right up my alley. My only problem is always dicing the squash…I do not have a good set of knife skills! Wow beautiful, can't wait to try this one. The color are gorgeous! This is great with pecans, walnuts, craisins, etc! I prefer to buy butternut squash already cut, so much easier! I made this (an adapted version) last night and it is definitely my new favorite salad. I used goat cheese, cranberries and pecans since that is what I had on hand but it was delicious! I've never cooked with butternut squash before and it was pretty difficult to peel and cut but it was well worth the effort. Thanks Gina!! This is not how I would typically use squash, but this makes me want to eat outside of the box. 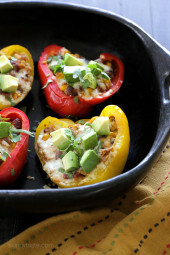 I stumble discovered this recipe post. Had this for dinner tonight with some crusty bread and it was delicious! Wouldn't change a thing, thanks for the recipe! YUM! Pumpkin, spinach and cheese is such a classic combination. Adding the dried cherries is such a good idea! Nothing like a bit of extra sweetness in your lunch. I'm not a huge butternut squash fan, but roasted paired with sweet and salty in the salad sounds devine. Love your blog. I believe points plus and pro points are the same. 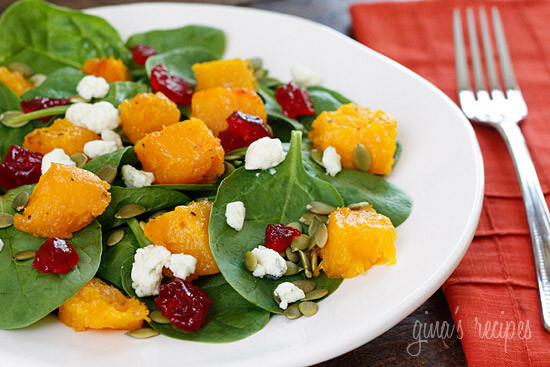 Yum this looks like the perfect fall salad! This sounds lovely! Can't wait to try. This looks gorgeous, and best of all delicious. This will be on my lunch menu some time this week, for sure. I'm off to the grocery store in just a few minutes to gather some of the ingredients I don't already have. That's a stunning salad! I'm so excited that it is finally fall and time for winter squash, it's one of my favorite foods! I adore butter squash and this looks delish! I am going to make betternut squash ravioloi this weekend and I will plan on making this with the leftover squash!